From Shuksep Jetsünma. This is the special lineage he holds. From Muktsang Kuchen Rinpoche at Gangri Thökar in front of Longchenpa’s kutsab. From Jamyang Khyentse Chökyi Lodrö, he received the Lama Yangtik and Khandro Yangtik at Mindroling. From Dudjom Rinpoche and from Dilgo Khyentse Rinpoche. Kyabje Trulshik Rinpoche was requested to grant these empowerments many times, but only did so for the first time very recently when he bestowed it in its entirety upon His Holiness the Dalai Lama. The second time he gave the complete Nyingtik Yabshyi in Nepal at Shechen Monastery for the young tulkus of Dudjom Rinpoche and Dilgo Khyentse Rinpoche and many other lamas and tulkus. 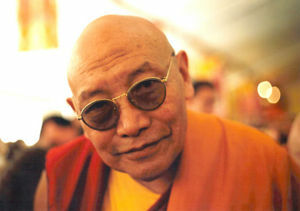 He has also given the Lama Yangtik at Lerab Ling and in the Dordogne. This page was last edited on 19 May 2012, at 12:01.